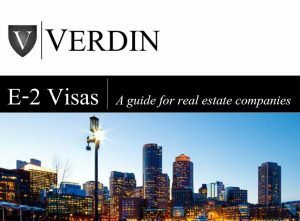 Given the strength and stability of the U.S. economy, it is not surprising that more foreign investors are selecting real estate business models to secure E-2 visas as a method of obtaining resident status and business presence in the U.S. The U.S. permits real estate companies to utilize the E-2 visa strategy, but companies must carefully structure their models to achieve success. This guide provides the general components of U.S. E-2 immigration law for foreign investors in the real estate industry . In addition to strategic business considerations to secure profitability, foreign investors in the real estate industry have to consider such factors as corporate structuring, nature of the capital investment, amount of investment required, and management of the business model. Foreign investors launching and operating real estate companies should plan for the following components of the law as they evaluate their strategic plans. This free ebook has the same information as the Amazon.com ebook.